This dynamic home practice will nourish the spine with prana and light and provide the perfect preparation for meditation. 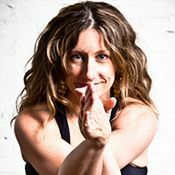 Using ujjayi breathing to create heat, move through warm-ups and standing postures, inviting stillness within the poses so that you can contain the prana you’re building. Continue with “L” salutes and uddiyana bandha, and then move to the floor for inversions, backbends, peacock, and seated postures. The practice concludes with 61-points relaxation and third eye kriya meditation.